How can you successfully prosper in an uncertain world? By actively Shaping your Future(s)! But what does that means today? Smart Businesses moved from focusing on income to focusing on Outcomes, i.e. Purposeful Innovation and meaningful Value Creation for all stakeholders, with positive impact on system issues. They connect Purpose with Profitability. Profit is the reward of the Value they create. And their Bottom Line is healthier than ever. So is their attractiveness for young generations who might be less interested in “building themselves a career” than in “living a meaningful life”. This is called a crisis of perception – the inability to see an emerging novel reality by being locked inside obsolete assumptions or business paradigm. A game-changing world requires game-changing approaches. Companies must reinvent themselves much more frequently than before. But no one can create the Future starting from obsolete maps. Strategic Innovation is about reshaping your Mental Maps to help you make today the strategic choices that will lead you to actively shape your Future(s). It is the alternative to traditional strategic processes which are based on analysis and linear Thinking. They generally lead to Forecasting, incremental Innovation and commoditized Strategies unable to cope with the wicked problems and the uncertainties you face. To stay relevant and prosperous in a completely new and unpredictable Strategic Landscape, every company needs more than just predictable and logical improvements. SAFE and LINEAR ways of Thinking are not enough. They might even be dangerous. What we do is a Fusion of Imagination, Serious Creativity, Scenario Thinking and Strategy for a more relevant type of Strategic Thinking. The type of audacious and vanguard Thinking that can “Get you to Next”. creatively seize them, i.e. 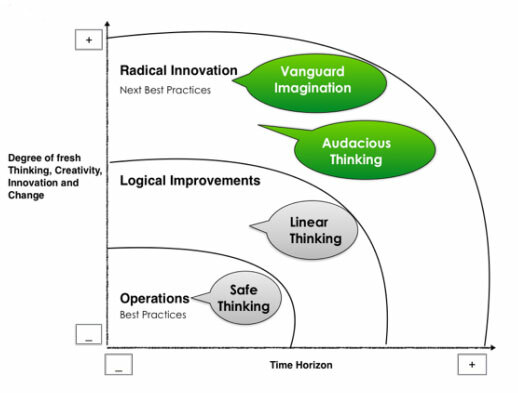 practice “Out-of-the-Box” and Breakthrough Thinking to envision alternative Future Scenarios, imagine truly innovative approaches to value creation and new growth possibilities, while competitors are still busy repeating the Past or Managing the Present. The process itself is Strategy as a Meaning-Making process which allows to RETHINK THE PAST, RECONSIDER THE PRESENT AND RE-IMAGINE THE FUTURE. Each of our Strategic Innovation workshops is designed to apply Creative Thinking to your most crucial and complex strategic issues.